Listed below are some of the most frequently asked questions that I have encountered when discussing Chinese Medicine with new patients. You are always welcome to submit additional questions . I look forward to hearing from you. While most people express fear or anxiety of needles before their first treatment, they are surprised at how pleasant and relaxing the treatment is. Unlike needles used for injections, acupuncture needles are very fine, roughly the thickness of a human hair. There is very little or no discomfort with needle insertion. On occasion, when there is discomfort, patients say it is like getting a mosquito bite. For your safety, only sterile, single-use disposable needles are used. Different patients feel different temporary sensations associated with the therapeutic effects of acupuncture which can range from mild tingling, heaviness, to a change in body temperature or localized area; to a sense of well-being, euphoria, floating or to a sense of energy flowing from one part of the body to another. These are all normal sensations of qi arrival. These sensations indicate that the body is responding to the treatment. There may also be no perceptible sensation at all which is also normal for many points and does not mean that the treatment is not having an effect. There are many body functions that go on all the time that we are unable to detect. Cupping is a form of Chinese medicine in which specialized, sanitized "cups" are placed on the skin to create controlled suction. Cupping promotes healing and improves range-of-motion by directing blood flow to the treatment area to promote the healing of a broad range of ailments. Cupping is considered to be relatively safe when performed by properly trained health professionals. Potential side effects include: bruising (lasting 3-7 days), mild discomfort, skin infection & burns (fire cupping only). For the safety and comfort of my patients, only sanitized, polycarbonate cups are used. No fire cupping is used. Acupuncture is one of the main forms of treatment in traditional Chinese medicine (TCM). It involves the use of very fine, sterile, single-use needles that are inserted into the body at very specific points. These specific points stimulate the body's natural healing process to adjust and alter the body's energy flow into healthier patterns and are used to treat a wide variety of health conditions. A surviving source of Chinese medicine is The Yellow Emperor's Classic of Internal Medicine, which is estimated to be at least 2,500 years old. Countless books have since been written on the subject of Chinese healing and its basic philosophies have been adopted over the ages by other Asian civilizations. Nearly all of the forms of Oriental medicine which are used in the West today, including acupuncture, acupressure, tui na & shiatsu massage and macrobiotics are a part of, or have their roots in, Chinese medicine. Although acupuncture is its best known technique, Chinese medicine traditionally utilizes herbal medicine, diet and nutritional therapy, lifestyle changes and other modalities to treat patients. Qi, or life force energy, runs throughout the body and its surface along pathways called channels or meridians. These channels nourish and regulate the functions of the body. Health is maintained when the energy flows freely in these channels and pathways. When the energy is blocked or depleted, pain or illness results. Stimulating acupuncture points normalizes the flow of Qi to help correct internal imbalances in the body, promote healing and maintain wellness. A more scientific explanation of acupuncture is that the stimulation of acupuncture points affects various systems of the body including the nervous system, the vascular and endocrine systems as well as brain chemistry. Western medicine theorizes that acupuncture meridians are actually part of the nervous system and that acupuncture relieves pain by releasing endorphins, or natural pain killers, into the bloodstream. Despite the ambiguity in the biochemistry involved, acupuncture continues to show effectiveness in clinical tests, from reducing pain to alleviating the symptoms of chronic illnesses and research and interest in acupuncture is growing. Qi is the fundamental life energy of the universe. It is invisible and is found in everything - air, water, food, sunlight, etc. In the body, it is the invisible life force that creates and animates life. We are all born with qi inherited from our parents and we also acquired additional qi throughout life from the food we eat and the air we breathe. In addition to what we consume, the level and quality of our qi also depends on the state of physical, mental and emotional balance. Qi as universal life force energy is a foundation of Chinese Medical theory. It encompasses the idea that all things in the universe are interconnected and composed of energy at various levels of vibration and are constantly changing and transforming; just as the water in the ocean today becomes the clouds in the sky tomorrow and the rain upon the earth the next day. Without Qi or life force, nothing could exist. Herbal medicine is a science that utilizes natural plant, mineral, and animal substances to treat disease and to promote and maintain good health. Medicines are administered as pills, teas, powders or as whole foods and supplements, and are taken both internally (by mouth) and topically (applied to the skin). 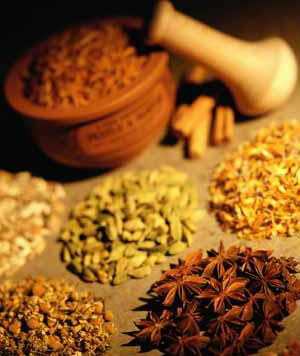 Single herbs can be prescribed for a very focused and particular effect e.g. to help promote sleep, or in formulas where they can be combined to harmonize and bring your body and mind into a state of balance. Patients are individually assessed and prescribed a custom formula suited to your particular constitution and areas of imbalance. How fast do herbs work and are there any side effects? Herbs work in a manner similar to pharmaceutical drugs, but for the most part they are mild in effect and work more slowly. They gently and effectively balance the body and assist the body's natural healing processes without causing harsh and unpleasant side effects. This gentleness is of great advantage for promoting balance and health, and is well-suited to long-term therapy for chronic conditions. The number of treatments will vary from person to person. Acupuncture is a form of therapy and, as with any other form of therapy requires time, effort and consistency. Factors that determine how many treatments are required are the nature, severity, and history of each condition, as well as the general health of the individual. If you are experiencing acute pain, you may receive immediate relief of the acute pain but may need further treatments to resolve the underlying factors which led to the acute flare-up. Acute problems generally respond quickly with one to three treatments. Chronic illnesses may require treatment for several weeks or months as a condition that you have had for years will not be immediately resolved. Fertility treatment usually requires weekly treatments for a minimum of three cycles. Usually one or two treatments per week are necessary to start and will taper off to preventative maintenance of once or twice a year. Again, as in any form of therapeutic care, attitude, effort and consistency together with a willingness to let go of unhealthy thoughts, habits, diet and lifestyle will affect the outcome and course of treatment. Does acupuncture correct hormonal imbalances? An increasing number of women are seeking an alternative to western medicine's answer to hormone therapy. Regular acupuncture treatments together with herbal medicine and nutritional therapy are very effective in regulating hormonal imbalances. Treatment focuses on supporting and balancing the hormonal regulation centers in the brain and autonomic nervous system (i.e., the hypothalamic-pituitary axis) and as a result, natural hormonal balancing can occur over time. Acupuncture affects the central nervous system to regulate the hypothalamic-pituitary axis (HP axis) and related hormone system. The HP axis is like the central control switch of the endocrine system. Acupuncture and herbal medicine also support and regulate circulation of blood and qi throughout the body and reproductive organs. Manifestations of poor blood and qi flow include: amenorrhea, dysmenorrhea, premenstrual symptoms, cramping, menstrual clots, menstrual pain, endometriosis, tubal obstructions, uterine fibroids, headaches, high FSH levels and other symptoms of hormonal imbalance. While the above symptoms in and of themselves will not necessarily be the primary cause of infertility, they are manifestations of internal blockages that can contribute to it. Still have questions? Please contact me. I look forward to hearing from you!